Steward of Savings : FREE Purify Your Body Detox Foot Pads Sample Pack! 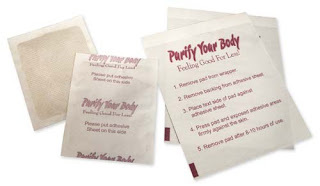 FREE Purify Your Body Detox Foot Pads Sample Pack! Have you tried Detox Foot Pads ? This is a great way to cleanse your body of toxins! Here's your chance to sample FREE Purify Your Body Detox Foot Pads for a limited time, please complete FORM with your address details to redeem offer and expect your FREE Sample in 4-6 weeks!